There are 21 freebies today. Make sure to check back throughout the day as I’ll update this post if free samples become available. Don’t miss out on freebies we share on the BargainBabe.com Twitter. Follow us today! Avon freebie – Today only, Avon.com is offering up FREE shipping — with no minimum purchase required — when you enter the promo code 1DAYSALE at checkout! Usually their codes are valid on orders of $10 or more. Check out the Outlet section for great deals! Bath & Body freebie – Bath & Body Works has a new coupon out! Print out the coupon to get a FREE product worth up to $14 with a purchase of $10 or more. Free iTunes App – Download the FREE Monsters, Inc. Run iTunes app only for a limited time ($.99 value)! 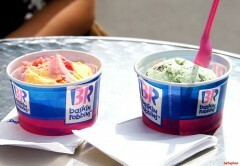 Baskin Robbins freebie – Head to your local Baskin Robbins every Wednesday from now until the end of March to snag a very sweet offer: Buy One Two-Scoop Sundae and Get One Free! Woohoo!!! Be sure to call ahead as this offer is only valid at participating Baskin Robbins locations. Dial freebie – Now through March 31, head on over to the Dial Facebook page and click on the “Healthier Skin” tab to enter to win a FREE bottle of Coconut Water body wash (250 winners!) or a $1,000 grand prize (1 winner!). A random drawing will take place on or around April 4. FREE after coupon and rewards! Free WSJ subscription – Fill out a quick survey to get a FREE 39-week subscription to The Wall Street Journal. Free App – Expired! Download the Real Bokeh app completely FREE for your iPhone 3GS, 4, 4S, or 5, iPod Touch 3rd, 4th, or 5th generation, or iPad (requires iOS 5.0 or later). This app allows you to enhance your photos by adding shapes in various colors and then share them via Instagram, Facebook, and more! 7-Eleven freebie – Download the 7-Eleven FREE app. After you do, sign in or create a 7-Eleven account to view special offers. You will see one for a FREE Medium Slurpee, valid through March 25! Do not tap “Redeem Offer” until you’re ready to score your Slurpee, as it is only good for 15 minutes once you do. Free eBook – The price is currently $0.00, but that could change at any time. Be sure to check the price before checking out. Download a free copy of Freelance Writing Bootcamp. Download a free copy of Circle of Friends Chili Cookbook. Download a free copy of Super Simple Home Cleaning. Blockbuster freebie – Blockbuster is celebrating their sponsorship of NASCAR newcomer Josh Wise’s car, #35 in the Daytona 500 by giving away a FREE 7-day movie rental to everyone. Just choose from one of the dozens of racing movies, add it to your cart, and use coupon code bbcar35 at checkout to get a free 7-day rental. Free Long John Silver’s — Calling all you shrimp lovers! Head to the Long John Silver’s Facebook page and click on the link on their wall post to score a coupon valid for 3 New Bigger Shrimp for FREE, valid through Feb. 28! Free Staples Bag — Pick up your FREE Eco Bag at Staples! Larabar freebies — Enter once for a chance to win LARABAR’s Uber Large Sweepstakes. There are 1,091 prizes to be given away including: 1 — single-speed Felt bicycle, 15 — tote bags stuffed with goodies, 20 — $10 donations to Make a Hero, 25 — 15-ct boxes of Apple Turnover Ã¼ber bars, 30 — water bottles with 4 Ã¼ber bars and 1,000 — coupons for 1 FREE bar. Ends Feb. 28! the real bokeh app is not free. I went through the iTunes password process, assuming it was not a published offer. I received the download but was charged for the app. I’ve bee trying to find contact into for the app’s maker, but so far haven’t. just FYI! @Kelly Sorry to hear that! The app was FREE, but they may have done a switcharoo when the page started getting all the traffic. As a rule of thumb, always check to make sure the items are still free before checking out. @Kelly That’s really disappointing! I HATE it when something is misadvertised. Very bad customer service and marketing on the part of the app maker. I hope you can return it.